Guilty of disorderly files? It's time to crack down on chaos. This Premium Collated Legal Divider Set features Tabs 1-25 and a Table of Contents tab, so you can organize index briefs, legal exhibits, mortgage documentation files and more. The white paper stock features Rip Proof reinforced tabs, and tabs are preprinted on both sides using Helvetica bold type, so you can easily access the documents you need. Indexes can fit any binding system because the binding edge is unpunched. It's easy to bring order to your own files. Go ahead, throw the book at disorganization. Consistency and efficiency rely on excellent documentation. These Ready Index Table of Contents Dividers help you organize important information so it can be located quickly and easily. The 10 preprinted, numbered multicolor tabs can be used in either landscape or portrait format. And with free templates from avery website, you can customize the included title page and print it from your laser or inkjet printer in minutes. Now there's an organizational solution that can raise your business to new heights. If your business is going to be a success story, everybody needs to be on the same page. These Ready Index Table of Contents Dividers help you keep organized so you can locate important documents quickly and easily. They feature 15 preprinted, numbered multicolor tabs that can be displayed in either landscape or portrait format. And with free templates from avery website, you can customize the included table of contents page and print it on your laser or inkjet printer in minutes. How's that for a happy ending? Sorting through a manual shouldn't be manual labor. 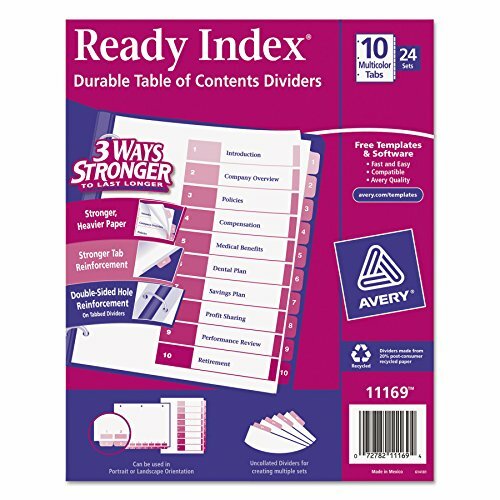 These Ready Index Table of Contents Dividers help you organize manuals or other documents so you can locate important information quickly and easily. They feature eight preprinted, numbered multicolor tabs that can be used in either landscape or portrait format. And with free templates from avery website, you can customize the included table of contents page and print it on your laser or inkjet printer in minutes. Organization and efficiency made simple you won't even break a sweat. 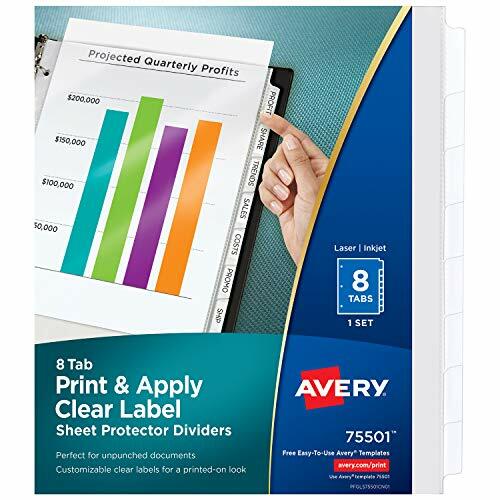 For those busy professionals looking for sheet protectors that are optimized to create professional-looking indexed projects, these easy-to-customize 8-tab plastic dividers are the perfect all-in-one solution. 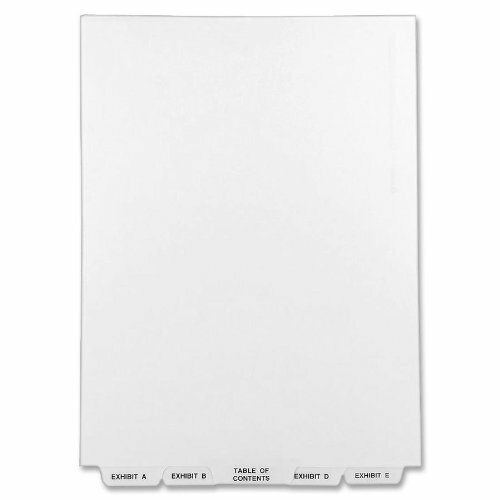 The clear top-loading tabbed index dividers feature contrasting white tabs and an Easy Peel sheet that lets you label your plastic divider tabs with ease and efficiency, saving you tons of time so you can organize your projects quickly. Whether you re working on one project or need multiple sets, these binder dividers will help you pull it off with professional results. 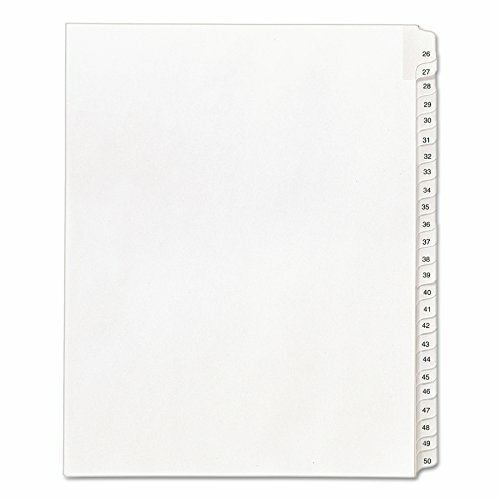 These tab dividers are perfect for organizing loose, un-punched papers. Use your tabbed plastic divider for customizing your presentation book, training guides, proposals, employee handbooks, project binders and more. The clear labels virtually vanish on the tabs, lending a clean, printed-on look to your dividers. Each tabbed plastic divider is easy-to-use with 3 ring binders and features a resilient construction ideal for frequent use while letting you easily preview your documents for quick referencing. These 8-tab dividers for 3 ring binders are excellent assets for helping you stay on top of things at the office, home or classroom. 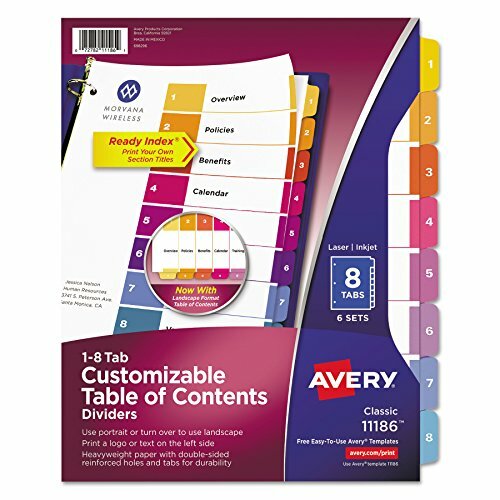 Customize your 3-ring binder dividers for home, school, work and more using the free templates and designs at avery.com/templates and print your tab labels. You'll have professional quality custom dividers to use within minutes. With these tabbed dividers at your disposal, you'll be able to finish projects faster and with more professional results. Taller and wider for use with top loading 9 x 11 sheet protectors. 2-in-1 tabs let you choose between portrait and landscape formats. The coordinating system of Table of Contents page and matching preprinted tab dividers, makes referencing easy and professional-looking. Three-hole punched for use in standard ring binders. Global Product Type: Index Dividers-Preprinted; Index Divider Style: Printed Numeric; Index Divider Type: N/A; Index Divider Size (W x H): 11 x 9 1/2. Taller and wider for use with top loading 9 x 11 sheet protectors. 2-in-1 tabs let you choose between portrait and landscape formats. The coordinating system of Table of Contents page and matching preprinted tab dividers, makes referencing easy and professional-looking. 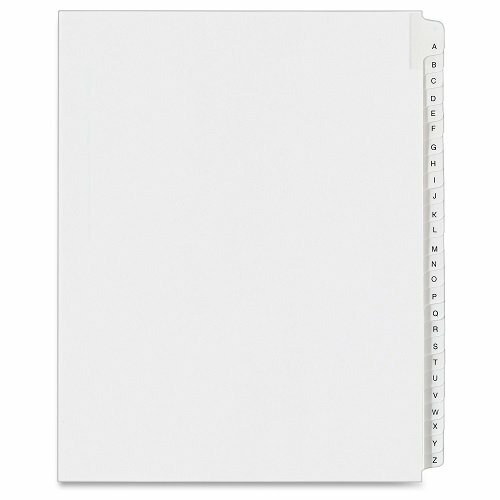 Don't work harder, work smarter: easily and quickly organize your presentations, projects and reference materials with these easy-to-customize 8-tab white dividers with white tabs. The dividers for 3 ring binders feature an Index Maker Easy Apply strip that lets you label all your tabs at once, saving you tons of time so you can focus on more important work. Whether you re working on one project or require multiple sets, these tabbed dividers will help you pull it off with professional results. The paper dividers are also spectacular for customizing your presentation book, proposals, project binders, employee handbooks, training guides and more. The clear labels virtually disappear on the tabs, giving your tabbed dividers a polished, printed-on aesthetic. These dividers are easy-to-use with 3 ring binders and feature durable, double-sided reinforced tabs and edges that are tear resistant and guaranteed to last. Create custom dividers for home, work, school and more using the free templates at avery.com/templates to design and print your tab labels in just minutes. 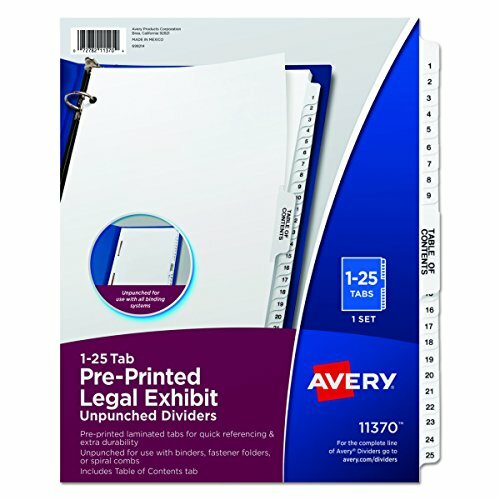 When you want disorganized files and unruly paperwork to cease and desist, turn to these Avery Collated Legal Dividers - Allstate Style featuring Tabs 26-50. Now you can bring order to index briefs, legal exhibits, mortgage documentation files, and more. 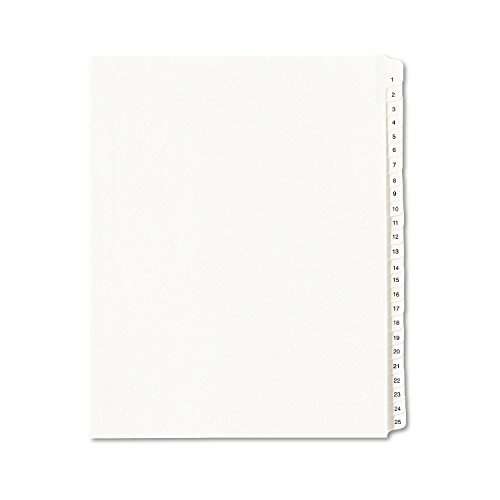 Clear and durable Rip Proof reinforced tabs on white paper stock help you reference your documents with ease, and are conveniently preprinted on both sides using Helvetica regular type so you can find what you need in a flash. The binding edge is unpunched so they can fit practically any binding system, giving your files a clean and professional appearance. Your motion for clean and orderly files has been granted. Index briefs, legal exhibits, mortgage documentation files and more. White paper stock with clear Rip Proof reinforced tabs. Tabs are printed on both sides. Binding edge is unpunched so indexes can fit any binding system. Dividers made with 30% post-consumer recycled paper. All state Style is printed using Helvetica regular type. Excellent documentation plus organization equals a more efficient business. These Ready Index Table of Contents Dividers will keep your business organized so important documents can be located quickly and easily. They feature eight preprinted, numbered multicolor tabs that can be displayed in either landscape or portrait format. 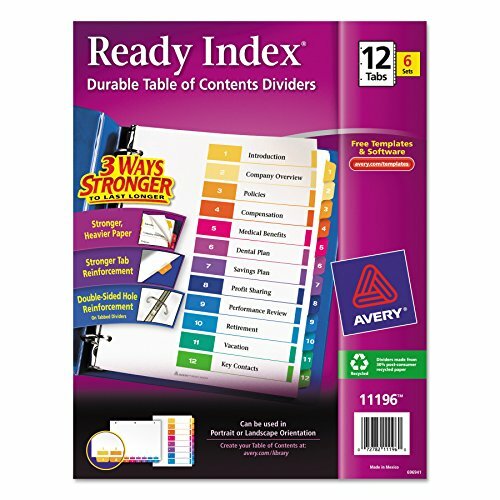 Now Three Ways Stronger to Last Longer with stronger, heavier paper, added tab reinforcement, and double-sided hole reinforcement on tabbed dividers. 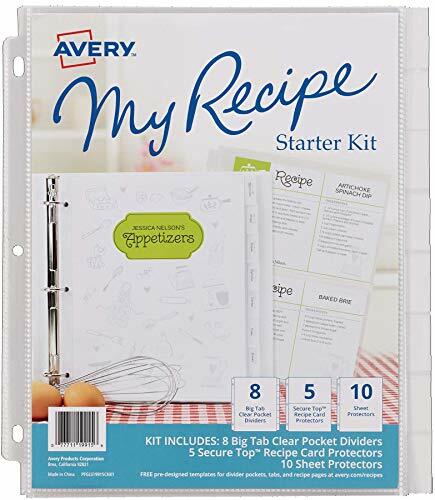 And with free templates from avery.com, you can customize the included title page and print it on your inkjet or laser printer in minutes. It all adds up to an outstanding organizational solution. 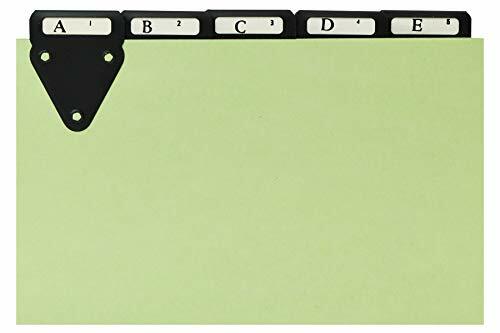 These 8-tab dividers for 3 ring binders are perfect for easily creating professional-looking customizable bound documents, reports and presentations right from your desktop. The tabbed dividers have an innovative Index Maker Easy Apply strip that lets you label all your tabs at once, freeing up more of your time so you can focus on more important work. Whether you re working on a single project or need multiple sets, these paper dividers will help you pull it off with professional results every time. Contemporary colored tabs help you locate sections quickly, while the clear labels virtually vanish on the tabs, giving your dividers a sleek, printed-on presentation. 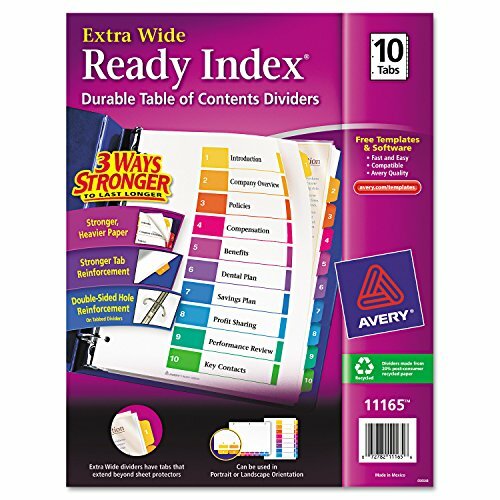 These sturdy binder dividers have durable double-sided reinforced tabs and edges for exceptional strength and tear resistance. They're fantastic for customizing your training manual, presentation book, legal exhibit dividers and more. Creating custom dividers for your specific application is simple: choose from one of the many free templates at avery.com/templates. 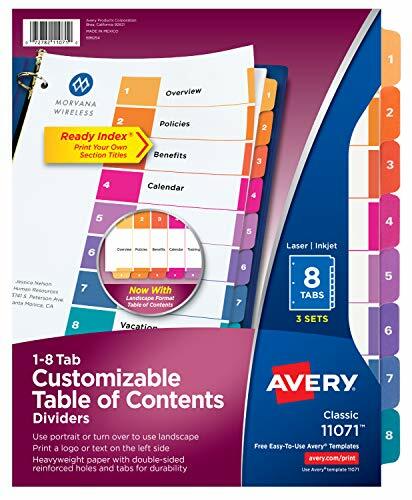 When you want disorganized files and unruly paperwork to cease and desist, turn to these Avery Collated Legal Dividers - Allstate Style featuring Tabs A-Z. Now you can bring order to index briefs, legal exhibits, mortgage documentation files, and more. 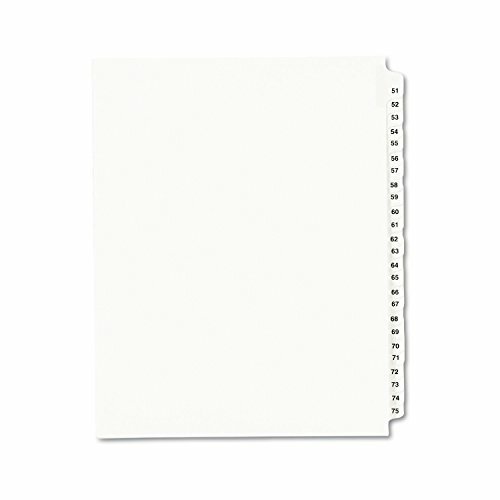 Clear and durable Rip Proof reinforced tabs on white paper stock help you reference your documents with ease, and are conveniently preprinted on both sides using Helvetica regular type so you can find what you need in a flash. The binding edge is unpunched so they can fit practically any binding system, giving your files a clean and professional appearance. Your motion for clean and orderly files has been granted. Rip Proof reinforced, dual-sided, laminated tabs make it easy to organize your information. The binding edge is unpunched, so these dividers can fit practically any binding system. Your motion for clean and orderly files has been granted. Ideal for index briefs, legal exhibits, mortgage documentation files and more! Global Product Type: Index Dividers-Preprinted Alphabetical; Index Divider Style: N/A; Index Divider Type: N/A; Index Divider Size (W x H): 11 x 8 1/2. The self-adhesive polyvinyl restores and strengthens ripped or damaged punched holes. Ensures documents will not rip or tear. Fits standard hole diameter. Comes in a handy and easy-to-use dispenser. Diameter: 1/4 in; Global Product Type: Hole Reinforcements; Material(s): Polyvinyl; Adhesive: Self-Adhesive Peel and Stick. Two-in-one tabs provide choice of portrait or landscape format. Makes referencing easy and professional-looking. Uncollated sets save time when assembling multiple reports. Print or photocopy titles framed with bright multicolors that match preprinted tabs. Two-in-one tabs provide choice of portrait or landscape format. 24 sets with 10 tabs in each set. Uncollated sets save time when assembling multiple reports. 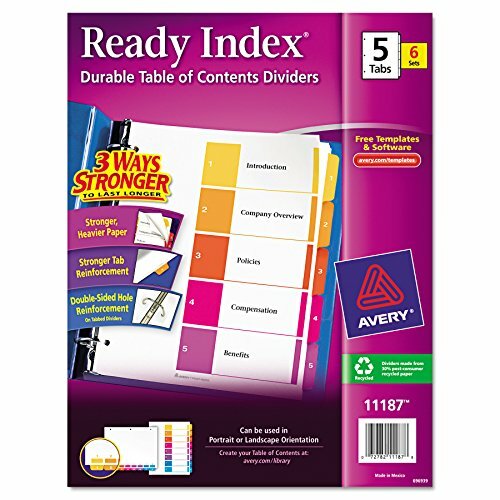 These alphabet index card guides are a convenient way for organizing index cards, recipe cards, study materials or anything else that needs sorting. Each card is 5x8 inches and made with sturdy, colored pressboard stock. Tabs are lettered A-Z with numbers 1-25. Don't work harder, work smarter: easily and quickly organize your presentations, projects and reference materials with these easy-to-customize 5-tab white dividers with white tabs. The dividers for 3 ring binders feature an Index Maker Easy Apply strip that lets you label all your tabs at once, saving you tons of time so you can focus on more important work. Whether you re working on one project or require multiple sets, these tabbed dividers will help you pull it off with professional results. The paper dividers are also spectacular for customizing your presentation book, proposals, project binders, employee handbooks, training guides and more. The clear labels virtually disappear on the tabs, giving your tabbed dividers a polished, printed-on aesthetic. These dividers are easy-to-use with 3 ring binders and feature durable, double-sided reinforced tabs and edges that are tear resistant and guaranteed to last. 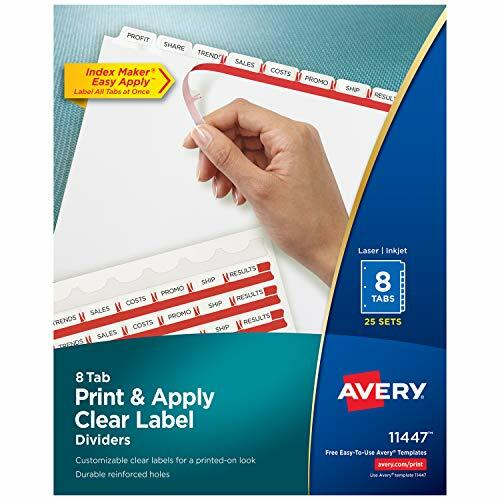 Create custom dividers for home, work, school and more using the free templates at avery.com/templates to design and print your tab labels in just minutes. You have the right to organized and professional-looking files. This Standard Collated Legal Divider Set features Tabs 51-75 so it's perfect for index briefs, legal exhibits, mortgage documentation files and more. White paper stock with clear, Rip Proof reinforced tabs are preprinted on both sides using Helvetica bold type for ease of use, and the unpunched binding edge gives you the freedom to fit practically any binding system. Here's evidence these dividers will do your files justice.